On this day in 1916, George Alexander Hopping signed up in Deseronto. He was born in Stratford, England on July 9th, 1897, the son of George Topping and Elizabeth (née Hormile). The Hopping family came to Canada in 1907. George joined the 155th Battalion with the regimental number 636461. He was five feet four and three quarter inches tall, with a fair complexion, blue eyes and fair hair. His service record shows that he left Canada on October 18th, 1916 and joined the 21st Battalion in France in December 1916. He received a gunshot wound to the leg in July 1917 and rejoined his unit in December. In January 1918 George received a good conduct badge. He left England for Canada in May 1919 and was demobilized in Kingston on May 24th. Hopping went on to serve in World War II. He met his first wife, Gladys Tooley, while serving in England: they married in Birkenhead, Cheshire on May 18th, 1945. George worked as a butcher and was a member of the volunteer fire department in Deseronto. Gladys died in 1957 and he married Rae Muenzler in 1961. 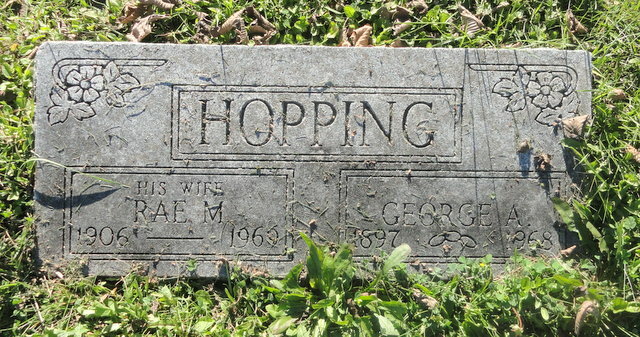 George Hopping died on September 26th, 1968 and is buried in Deseronto Cemetery. Rae Hopping died three months later.